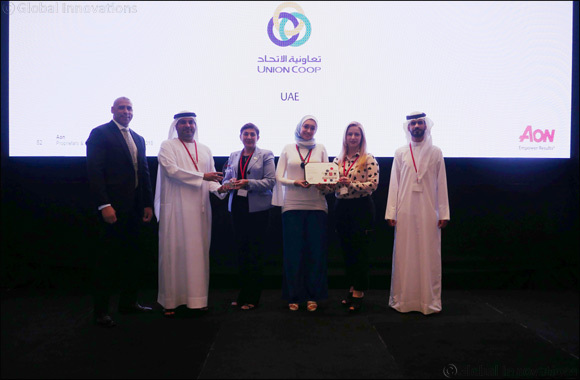 Dubai, UAE, October 31, 2018: Union Coop has been recognized as an ‘Aon Best Employer in the Middle East’ by leading global professional services firm Aon, which provides a broad range of risk, retirement and health solutions. The results were announced at the recent Aon Best Employers Middle East 2018 Awards Ceremony at the Oberoi Hotel in Dubai. The 2018 Aon Best Employers Middle East winners were selected based on ranking consistently high levels for employee engagement, organizational agility, engaging leadership and strong talent focus. The rigorous process saw participating organizations assessed against Aon’s regional database of more than 350 organizations and 275,000 employees. This year, nine organizations across the Middle East – including Union Coop – were selected for the prestigious honour across sectors ranging from logistics, hospitality and F&B to aviation, pharmaceutical and e-commerce. Mr. Khalid Humaid Bin Diban Al Falasi, CEO, Union Coop, said: “On behalf of the Union Coop family I would like to thank everyone associated with this award. This prestigious award is a recognition of our life-long commitment of a progressive and innovative working environment that is powered by ‘happiness’ for our 3100 employees, across 14 branches. Now in its sixth edition, the Best Employers Middle East study is the most comprehensive employer benchmarking program of its kind in the region. Launched globally by Aon over 18 years ago, Best Employers has become an international benchmark for business, affording organizations the unique opportunity to assess and understand the level of engagement amongst their employees. This year, the competition was stronger than ever, with an increase of 26% in the number of participants year on year. The increase reflects the growing awareness amongst organizations in the Middle East of the importance of employee engagement and satisfaction as a key pillar of an effective business strategy for attaining and maintaining a competitive advantage.